To be honest, I am really not an expert when it comes to screen protectors. I have not taken the chance on trying different screen protectors. I have, basically, stuck (pardon the pun) with what I started using on my Palm Pilot 1000, which are the adhesive-type screen protectors that reduced glare and gave the screen a paper-like writing finish. Since then, I have continued to use the WriteRight screen protectors for all my devices including the 50+ devices I support at work. Now, I have read many reviews on screen protectors, but I have not been persuaded enough to change what I was using, especially at the chance of losing $10 - $15 if the product did not live up to my expectations. 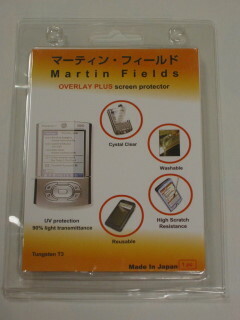 Finally, I have an opportunity to try a different screen protector, the Martin Fields Overlay Plus PDA Screen Protector. In this case, it was worth the wait! The first thing I noticed was that the screen protector was a rigid plastic, not a soft flexible piece of plastic like the WriteRight I used to use. This made me feel even better about the protection of the Martin Fields product. In addition, this made the product easier to install with excellent results. The gentle adhesive backing also aided in the ease of installation. It was simple to align with the screen, and there were no air bubbles in the installation. I applied it perfectly, the first time. Something else I noticed before I even installed it on my device, the Martin Fields Overlay Plus screen protector is crystal clear. 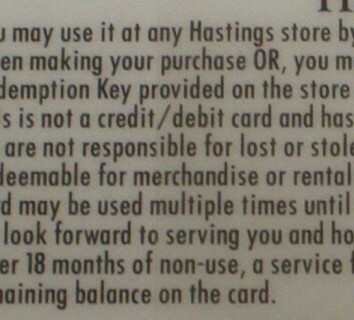 Just to show the clarity, I took a picture with the screen protector half way covering the back of a gift card (see below). Can you tell which half is covered by the screen protector? Half of the card is covered by the Martin Fields Overlay Plus screen protector (with the adhesive backing still on)! Like I said, "It is crystal clear!" With this screen protector installed, you see all that you meant to see. There is not a hint of distortion or discoloration of the screen. It does all a screen protector is suppose to do, protect the screen without you realizing it is there. It is simply beautiful! I highly recommend the Martin Fields Overlay Plus screen protector, period! I love the protection the harder plastic provides and the effortless writing the smooth surface provides. Most of all, I love seeing my beautiful, 320 x 480, 16-bit color screen the way it was meant to be seen! I even find myself turning on my T3 just to look at the screen. I have not done that since I first bought it. I have fallen in love with my T3 all over, again. Thanks Martin Fields!